EAA and WEAM HELP KEEP U. S. BARNSTORMING ALIVE! Tracy Miller takes photos of the Ford Tri-Motor as it taxis this past week at the Santa Teresa International Jetport. Photo Courtesy of Mark Lambie and the El Paso Times Newspaper. Ford Trimotor Captain Steve Lambrick waves from cockpit. This particular ship is powered by three P&W R-985 Wasp Junior engines of approx. 400HP each. But the planes could and were equipped with many different engines of more or less horsepower. Different models also had different cockpit and windshield designs – some were streamlined (slanted back) and some actually slanted forward (as does this model in which we rode this weekend), while others were simply vertical windshield panes. Some had engine cowls on their outboard or wing mounted engines, some even on the nose engine, and some even had fenders over their wheels, while some others had streamlined fairings over vertical wheel strut supports. Some Tri-motors were seaplanes and others were fitted with skis for snow bound operations. The ship was first designed by William Bushnell Stout to be single engined. But Stout sold out manufacturing rights to his aircraft to Henry and Edsel Ford. His designs were originally inspired by the all-metal German aircraft designer, Hugo Junkers, and closely resembled the German’s Fokker F-VII Trimotor. Junkers sued Ford when he tried to sell the planes in Europe – – – and he won, since the Ford too closely resembled the Junkers G-24. While the corrugated aluminum sheeting was very strong compared to the flat sheets coming into use, it was aerodynamically productive of far too much drag. Ford sued Junkers a second time, and the court in Prague again declared that the Ford Trimotor had impinged on the Junkers’ patents. Ford’s later AT-5 version had drop-down cargo containers in the bottom part of inner wing sections. More than a dozen Ford Trimotors were purchased by the Army Air Corps in the early thirties with varied engine models from 200HP to 300HP. Ford’s pilot, Henry J. Brooks died in a test flight, causing Ford to lose his enthusiasm for aviation investments. Before abandoning his aviation enterprise, Ford designed “every man’s” airplane, a single seat commuter plane called the Ford Flivver in 1927. Meantime, a total of 199 Ford Trimotors were built between 1926 and 1933, including 79 of the 4-AT variant, and 116 of the 5-AT variant, plus some of an experimental variety that were never produced. One of Latin America’s earliest airlines, Cubana de Aviación, was the first to use the Ford Trimotor in Latin America, starting in 1930, for its domestic services. Ford Test Pilot, Harry Brooks, is piloting the Flivver. Below are the two videos (Part I and II) shot and edited by Ric Lambart on the last day’s ops. The first video is 7:07 minutes long, less the end credits and the second (II) is 14 minutes long. Pre-production prototype, powered by three 200-hp (150-kW) Wright J-4 Whirlwind radial piston engines, accommodation for two pilots and eight passengers; one built. The original production version, similar to the Ford 4-AT prototype; 14 built. Improved version, powered by three 220-hp (165-kW) Wright J-5 Whirlwind radial piston engines, accommodation for two pilots and 12 passengers; 39 built. Similar to the Ford 4-AT-B, equipped with a 400-hp (300-kW) Pratt & Whitney Wasp radial piston engine, fitted in the nose of the aircraft; one built. Three aircraft similar to the Ford 4-AT-B, each with different engines and minor modifications. Similar to the Ford 4-AT-B, powered by three 300-hp (225-kW) Wright J-6-9 Whirlwind nine-cylinder radial piston engines; 24 built. One aircraft similar to the Ford 4-AT-E.
Enlarged version, powered by three 420-hp (320-kW) Pratt & Whitney Wasp radial piston engines, accommodation for two pilots and 13 passengers, the wingspan was increased by 3 ft 10 in (1.17 m); three built. 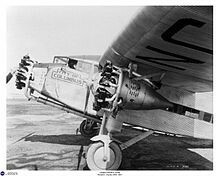 Similar to the Ford 5-AT-A, powered by 420-hp Pratt & Whitney Wasp C-1 or SC-1 radial piston engines, accommodation for two pilots and 15 passengers; 41 built. Improved version, similar to the Ford 5-AT-A, accommodation for two pilots and 17 passengers; 51 built. Seaplane version, fitted with Edo floats; one built. Increased-weight version, powered by three 450-hp (340-kW) Pratt & Whitney Wasp SC radial piston engines. The wings were mounted 8 in (20 cm) higher, to increase cabin headroom, but otherwise similar to the Ford 5-AT-C; 20 built. Proposed version, the engines were relocated to the wing leading edges. Similar to the Ford 5-AT-A, powered by three 300-hp Wright J-6-9 radial piston engines; three built. Redesignation of a single Ford 6-AT-A, equipped with a 420-hp Pratt & Whitney Wasp radial piston engine, fitted in the nose of the aircraft. One Ford 5-AT-C converted into a single engine freight transport aircraft. Six different engines ranging from 575 hp (429 kW) to 700 hp (520 kW) were installed. Redesignation of a single Ford 4-AT-B, fitted with three 300-hp Pratt & Whitney Wasp radial piston engines. Redesignation of a single Ford 4-AT-E, fitted with three 225-hp Packard DR-980 diesel engines. Redesignation of a single Ford 5-AT-D, fitted with two 300-hp Wright J-6-9 Whirlwind radial piston engines, and a 575-hp (430-kW) Wright Cyclone radial piston engine fitted in the nose of the aircraft. Large three-engined version, powered by three 1000-hp (750-kW) Hispano-Suiza 18 Sbr piston engines (W engines: 3 x 6 cylinders), accommodation for two pilots and 40 passengers. One Ford 5-AT-D was converted into a three-engined bomber aircraft. One 4-AT-A evaluated by the United States Army Air Corps, redesignated C-3 after evaluation. One C-4A re-engined with three 450-hp R-1340-7 engines. Military transport version for the U.S. Navy (one) and U.S. Marine Corps (two), based on the Ford 5-AT-C; three built. This entry was posted in AVIATION NEWS, HOT NEWS! on April 27, 2017 by FASFRIC.